Chop up butter and place in bowl of an electric mixer fitted with a paddle attachment, add sugar and beat on low until sugar is fully incorporated. Scrape down sides of the bowl with rubber spatula and beat on high until mixture is light and fluffy, approximately 3 minutes. In a medium bowl, sift together the flours and salt, then add to the butter-and-sugar mixture. Mix on low speed until the dough starts to come together. Place dough onto a surface dusted with flour and shape into a flat disk, about 1-inch thick. Wrap in plastic and chill for 30 minutes, until firm but still pliable. Roll the dough 1/2-inch thick on a lightly floured surface and use 1.5’’ round cookie cutter, preferably fluted, to slice coins. 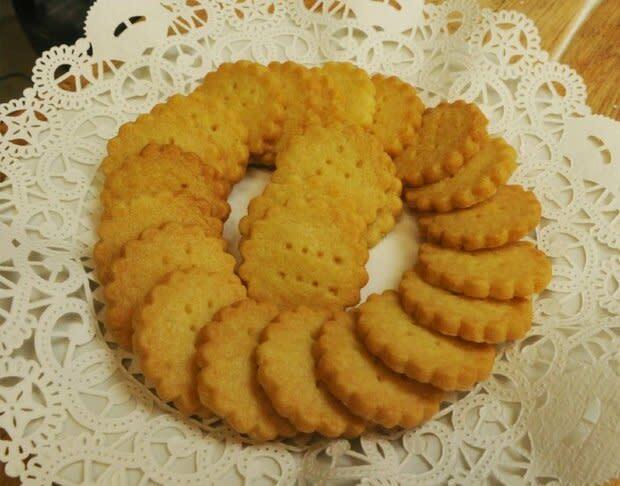 Place the cookies on an ungreased baking sheet and use tines of fork to make 8 indents in each coin. Chill cookies in refrigerator on tray for another 30 minutes. Bake for 20 to 25 minutes at 350 degrees, until the edges begin to brown. Allow to cool to room temperature before serving.